Software giant Microsoft has today announced two major developments for Microsoft Office in the cloud storage area. Third-party storage providers can now integrate their service into the Office apps for iOS, via an open API, and has introduced a new Cloud Storage Partner Program for Office Online. 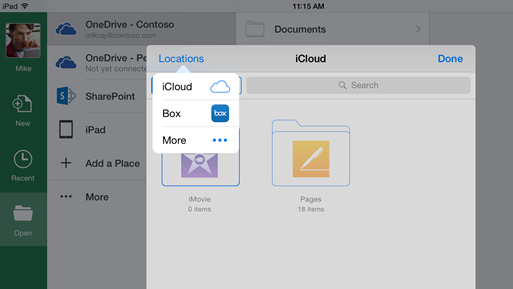 If you are using iOS, third-party cloud storage providers can natively integrate into the “Locations” picker. This means Word, Excel, and PowerPoint users can open, edit, and save documents from these providers directly in the apps. Office for iOS apps today received iCloud support. You can download the new versions now directly from Apple’s App Store. Microsoft has said it is working on the same type of integration in its Office for Android apps as well as the Office universal apps for Windows 10. Their goal is to ensure that regardless of what device, platform, or storage provider you’re using, you’ll be able to access your Office documents in the apps. When it comes to office online, cloud storage services can now integrate the suite into their applications, lettings users open, view, and edit documents stored in those services in any browser. Microsoft says it is already working with Box, Citrix, and Salesforce as a part of its new partner program.